Everyone loves LEGO. They’re fun, colorful and offer a world of possibility. It isn’t all about cool toy buildings and LEGO spaceships, either. Here are five things you didn’t know could be done with LEGOs! LEGOs are a great way to exercise creative and out-of-the-box thinking. It’s no surprise that we have many cool and interesting creations both from the LEGO company itself and from fans. Some people, however, managed to make incredible things with these plastic interlocking bricks. In no particular order, here are five of them to show you, courtesy of BrickPals.com! 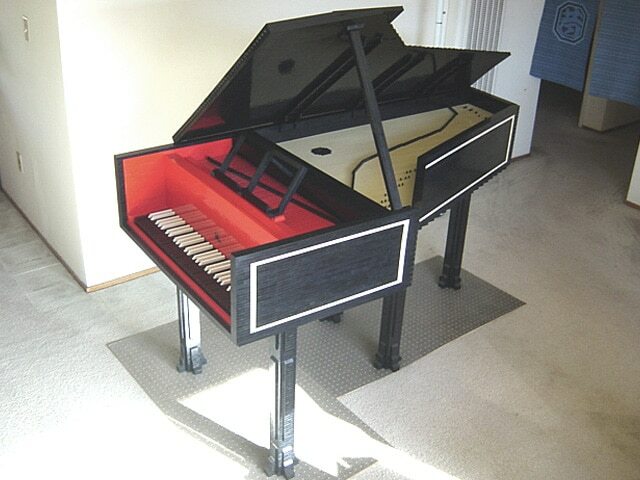 The LEGO Harpsichord is a full-sized, fully-functional musical instrument made by Henry Lim. The harpsichord is an older version of the piano, smaller and simpler, which makes it a perfect candidate for LEGO bricks. This build is entirely made of LEGOs, the only non-brick pieces being the strings themselves. You can check the build in Henry Lim’s official website, which includes a sound sample. This isn’t the only musical instrument made of LEGO: there are others out there, including a ukulele. Other than the harpsichord, Henry creates full-sized sculptures of various things, such as dinosaurs and people, out of LEGO. This creation isn’t just a life-sized LEGO car. It actually works! Made entirely of LEGO bricks (including the engine) except for some structural parts such as wheels and tires, this car moves on compressed air and can reach speeds of around 15 to 20mph. Steve Sammartino and Raul Oaida, with the help of 40 patrons and over 500,000 LEGO bricks, designed and built the car themselves. Raul Oiada, a teenager from Romania, built it and then shipped it to Melbourne, Australia, to an undisclosed location. Once there (and after some repairs due to damage to the pieces), the car took to the streets, a full-sized success. Yes, it makes real coffee. Yes, it’s made of LEGOs. This amazing design does use some extras, mainly SAM Labs’ motors for some of the mechanisms, and it includes a heating coil for the water and coffee. It uses powdered instant coffee, so it’s not exactly the same a just-ground coffee, but for a LEGO creation, it’s pretty impressive nonetheless. This LEGO house was a full-sized, fully functional home. Located in Denbies, Surrey, over a thousand volunteers put the house together with over 3 million LEGOs. From chairs to goblets, from a bed to a hot shower and working sink and toilet, the full thing was perfectly livable! It even included a little LEGO cat and decorations. Unfortunately, this fantastic feat of LEGO creativity came to an end in 2009. Attempts to sell it to Legoland failed due to shipping costs, and conflicts over building permits caused the house’s demolition. James May, who initiated the project to build the house, later hosted the James May’s Toy Stories where he talked about favourite toys of the past and how they came to the modern world. Yes, you read that right. This isn’t 3D printing LEGO bricks; it’s making a printer out of the bricks themselves. Surprisingly, there are several LEGO 3D printers out there, and some designs are available for anyone to build for themselves, but we found this one particularly interesting. In this design, developed by Arthur Sacek, the printer carves any 3D design out of floral foam. The only part of it that isn’t LEGO is the drill. So there are some remarkable things that can be done with LEGOs. Did you know of them? Do you know more? Let us know!